Worried About Bed Bugs In Your Hotel Room? Bed bugs can quickly become a serious pest problem. Chances are if you have bed bugs, you brought them into your home while traveling. These pests do not travel on humans or animals, but on luggage, clothing, pillows, and other items you bring when you leave home. Hotels, even the best kept hotels in the world, can end up with a bedbug infestation. How the hotel handles complaints and how fast they act to stop the spread of bugs is the most important question. Perhaps you are concerned about the hotel you’ll be staying at? Perhaps you are one of those unfortunate people who were bitten and would like to verify the hotel’s claim that such a problem has never occurred before? Bedbugs are a global problem, so any traveler needs to understand how to protect themselves from bringing home bed bugs when traveling. Here is a very efficient way of researching hotel bedbug complaints and it’s a completely free service. As a first step, you can check the Bed Bug Registry to see if the hotel you are planning to visit has had a bed bug problem. If a bed bug problem is reported,only when not taken seriously and followed up thoroughly do they become a continual problem. Don’t bring home hitchhikers when traveling! Inspect your hotel room before you call it a night. Examine your luggage thoroughly with each new place you go. Wash and dry clothes with hot water and high heat as soon as you get home. Experts recommend removing and examining the headboard if possible. Check for tiny black spots (excrement) that are smaller than poppy seeds. You may also see translucent light brown skins or, in the case of an infestation— live bugs. You may want to elevate suitcases and keep them off the floor, like on a luggage stand. If bed bugs are detected, travelers should request for another room. Be sure to inform hotel management. When you pack to leave, inspect your luggage carefully first, and inspect every item as you pack to help detect any bugs or their signs. Laundering most cloth items with typical hot water and detergent followed by drying on low heat for at least 20 minutes (or standard dry cleaning) should kill all bed bugs in or on such items. Sealing freshly-laundered items inside a plastic bag should help keep any more bed bugs from getting in those items later to hide (and be carried back with you). Although over-the-counter pesticide products that have “bed bug control” written on the label can be found on store shelves, they generally are not recommended. Perfor­mance of these products under actual field conditions is not known. If you need to use a pesticide, you are better off hiring a licensed, Minnesota professional pest control expert with experience in treating bed bugs. For Guaranteed Bed Bug Removal MN, contact a Minnesota pest control expert as soon as possible! Bed Bugs Are Back! In news that may give you hives… Minneapolis is the 15th most bed bug-infested city in the country. The first comprehensive genetic study of bedbugs, the irritating pests that have enjoyed a world-wide resurgence in recent years, indicates they are quickly evolving to withstand the pesticides used to combat them. The new findings from entomologists at Ohio State University, reported online in PLoS One, show that bedbugs may have boosted their natural defenses by generating higher levels of enzymes that can cleanse them of poisons. Recent studies show that bedbugs around the world have developed a resistance to the chemicals used to control them. Scientists are now studying the molecular biology of these pests to develop more lasting control measures. The findings add to a growing body of evidence from molecular-biology studies that bedbugs have recently evolved at least three improved biochemical defenses against common pesticides. Bedbugs today appear to have nerve cells better able to with stand the chemical effects, higher levels of enzymes that detoxify the lethal substances, and thicker shells that can block insecticides. The ability of bedbugs to survive once-lethal doses of insecticides is the newest evidence that efforts to eradicate pests that plague humankind may make some of them stronger. It is a key reason for the spread of bedbugs in the past decade. Well-adapted to homes, hotels and dormitories, these tiny blood-sucking parasites usually hide in mattresses, bed frames and furniture upholstery. Bedbugs feed every five to 10 days, leaving painful welts on the skin and sometimes triggering allergic reactions. Laboratory tests show today’s bedbugs can survive pesticide levels a thousand times greater than the lethal dose of a decade or so ago. There is a phenomenal level of resistance. Since the pesticide DDT was banned starting about 40 years ago, people usually have treated bedbug infestations with pesticides based on a family of compounds called pyrethroids, usually deltamethrin or lambda-cyhalothrin, synthetic versions of chemicals found in chrysanthemum blossoms. There are few chemical alternatives, because the residential market for insecticides is relatively small, and the cost of development, safety tests and regulatory approval is relatively high, several researchers said. Since the bugs don’t transmit any serious infectious diseases, there also is little medical funding to research new control measures. Repeated applications of the same insecticides act as a form of natural selection for bedbugs. Any surviving insects pass on traits to their offspring and to succeeding generations. Correct diagnosis of a bed bug problem is important. Older established infestations are fairly easy to detect; but in the early stages, they can be much more subtle. As people become more aware of this pest, all manner of welts and itches may be attributed to bed bugs though they are often caused by other factors. Because it is hard to diagnose a bed bug bite by merely examining the patient, the pest management industry must play a key role in confirming infestations. Eliminating bed bugs can be expensive and requires a pest control strategy known as an Integrated Pest Management Plan. A treatment can take weeks to several months. Several treatments may be necessary for complete success. For Bed Bug Removal Guarantee, call a bed bug experienced Pest Management Professional IMMEDIATELY to exterminate all the pests, ensuring they will not return! Do not try and treat this problem yourself. The once-forgotten bed bug has rebounded in a major way throughout the U.S. A survey out last month of pest control companies estimated that 95 percent of exterminators had reports of bed bugs in their area, as opposed to 25 percent in 2000. Although New York City has been the most notorious, with infestations in movie theaters and retail clothing stores, Minneapolis is on the list of the top 15 most infested cities in the country. For the first time in memory, exterminators were hearing from hotels about bed bugs. The pest control industry had nearly forgotten about bed bugs after DDT wiped them out in the 1950s and ’60s. The earliest anyone in the Twin Cities can remember hearing about them is 1995, though it wasn’t until 2005 and 2006 when local exterminators started getting deluged with calls. Bed Bugs are back in Minnesota. And they were hungry! Minnesota pest control exterminators say bed bugs continue to be a problem in the Twin Cities. Meanwhile, the stories kept getting more gruesome. Several Twin Cities exterminators repeated the experience of being in houses so overrun that bugs rained from the ceiling. Bed bugs have popped up in local apartment complexes, nursing homes, group homes, and hospitals. One exterminator tells the story of a man who went to the ER so chewed up the doctor assumed he’d been in a fire. Exterminators do not see a pattern in how they’ve spread across the Twin Cities. Bed bugs are also incredibly hardy. Exterminators tried sprays, vacuums, steam cleaning, freezing—nothing seemed to work. A mattress that had been left outside in the snow for several weeks in January came back in with living bugs. They can survive a year without feeding. Recent research indicates that this generation of bed bugs is up to 12,000 times more resistant to pesticides than their ancestors. And they spread in the most unlikely ways. Although over-the-counter pesticide products that have “bed bug control” written on the label can be found on store shelves, they generally are not recommended. Perfor­mance of these products under actual field conditions is not known. If you need to use a pesticide, you are better off hiring a licensed, professional pest control expert with experience in treating bed bugs. For Guaranteed Bed Bug Removal MN, contact a Minnesota pest control exterminator as soon as possible! Economically, bed bug infestations are also a burden on society. Although the exact dollar amount is not known, the economic losses from health care, lost wages, lost revenue and reduced productivity can be substantial. The cost of effectively eliminating bed bugs may be significantly more than the cost of eliminating other pests because bed bug control usually requires multiple visits by a licensed pest control exterminator and diligence on the part of those who are experiencing the infestation. Control in multi-family homes is much more difficult than in single family homes because bed bugs frequently travel between units, either by direct transport by humans or through voids in the walls. There are additional costs and complexities associated with coordinating and encouraging participation from multiple residents. You CANNOT get rid of bed bugs on your own. It is important to accurately identify offending insects before beginning any extermination treatments. Home remedies and those available in stores are rarely effective in treating an entire bedbug infestation. Because bed bugs can survive extreme temperatures (up to 113 degrees Fahrenheit) and are extremely difficult to kill, severe infestations usually are best handled by a licensed pest management professional with specific experience in preventing and treating these pests. If you choose to utilize an over-the-counter insecticide, be sure to read and follow all label directions closely. All homes are vulnerable to bed bug infestation. An ounce of prevention can save thousands of dollars and six months of lost sleep. Protect your home now, before it is too late! There’s a new invasion sweeping the country – bed bugs. These blood-sucking insects hide in your luggage when you travel to hotels, and become unwelcome souvenirs from your trip. Once at your home, they easily spread and begin feasting on your blood. Minnesota pest control companies say bed bugs are a growing problem in the Twin Cities. Throughout the country, infestations of bed bugs are on the rise. Not only do they invade your home, but they bite and actually use human blood to survive. While you’re sleeping, bed bugs attack your body, leaving red, irritating bite marks when you wake up the next day. Bed bugs also leave visible feces in your beds, carpets, and floor. Living in your carpet and mattresses, bed bugs have even led people to move out of their homes just to get away from the insects. Perhaps the most unfortunate aspect of these bugs is the difficulty people have had getting rid of them. Do you think you’re safe? Think again. Bed bugs are spreading across hotels like never before. They can become unwanted souvenirs in your luggage, and leave you with a huge bed bug problem at home. An assessment to the extent of the problem must be determined by an inspection. Eradication can only be achieved through detailed inspections and the elimination of the live bed bugs and the eggs from the premises. Treatment involves chemical and non-chemical approaches. The advantage of a pest control expert is that they know where to look, and may have equipment and chemicals that is not sold to consumers. If you are concerned about bed bugs becoming a problem in your home, it is recommended that you contact a Minnesota pest control company as soon as possible for an inspection for prevention and control measures. All it takes is a few females who can lay up to five eggs a day to begin an infestation. It happens startlingly fast. 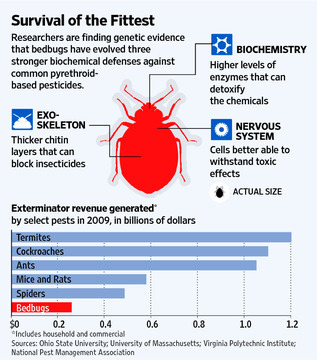 Statistics show a 10-fold increase in bed bug treatments in recent years. Entire buildings, shopping centers, hotels, homes and apartment buildings across North America have been shut down due to bed bug infestations. Any home, even one that is cleaned daily, can suffer bed bug infestation. After a home has been purged of the blood sucking insects, at great cost to its owner, it can be attacked again. Prevention and treatment are two of the affordable keys to keeping you and your loved ones from becoming bed bugs’ food while you sleep. With the current explosion of bed bug infestation, it pays to be preventative. There is not clear resolution to the growing bed bug epidemic. Many cities and states are just starting to adjust laws that govern landlord/tenant rights to include bed bugs. Others are using education to warn residents regarding bed bug protection methods. Bed bug pest control firms are quickly getting up to speed on the latest chemical and mechanical methods of bed bug removal. The future however, is largely based on the ability to come up with either an organic or pesticide based method of killing bedbugs that provides lasting protection against these insects. Until then, the worldwide bed bug epidemic will continue to be a problem. What Should I Do If I DO Find Bedbugs? DO NOT replace the items in the infected areas until instructed to do so by your Pest Management Professional who has given you clear instructions on how this should be done.